Participants of the Euro club “Commonwealth” took part in the student forum “Youth against Corruption! We join European values!”. 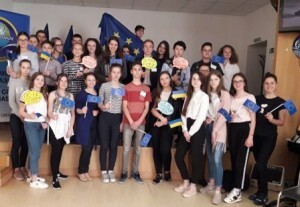 The event took place on the basis of the First City Gymnasium with the support of the EU Delegation in Ukraine, within the Euro club Competition. The main purpose of the forum was to educate a person with an active social position, acting in accordance with moral and ethical principles, European values ​​and able to make responsible decisions. Our school was represented by pupils of grades 9-10: Bohdolova Yulia, Ihnatieva Evelina, Koval Alina, Rudenko Stanislav, Solomakha Victoria, Tovstopiat Nikita, Chepurna Anna and Shevchenko Lilia. The forum was held in the form of practical exercises and training sessions. Participants learned about the harm that corruption inflicts on a particular person and learned how to show it in everyday life, to give them a proper personal assessment. All participants received certificates and gifts from the EU Delegation in Ukraine.